When I first decided to start trying to get pregnant I would imagine what kind of parent I would be. I would be firm but fair. I would not let my kids act like those “other” kids you see in public. I would teach them everything they need to know in a way they understand. They are going to listen to me and respect me because that’s how I will train them to be. Well….if you want god to laugh just tell him your plans! Every last thing I said I would never do as a parent I have done. Although I have done all the things I said I would do, the outcome was not always what I envisioned. One thing I do know now is that my kids have taught me just as much, if not more then what I have taught them. More then just the obvious things such as time management, patience, and better organization. On a deeper level they are the closest thing to an authentic soul as you can get on this earth. They haven’t been jaded or beat down to the point of feeling insecure. I think a lot of times we don’t necessarily see kids as human and expect from them what we would never ask of ourselves. We try to tame a pure spirit into someone of our liking and in doing that I’m not sure if we are doing them a service or disservice. With that, I would love to share the amazing things I have learned from my kids. Have you ever seen a little girl dancing around, arms flying, legs shaking, twirling around with the biggest smile on her face. In that moment she is the most beautiful ballerina on earth. Have you ever seen a little boy just sprinting as fast as he can against nobody just cause he wants to. In that moment he can run faster than any human on earth. He is the best, a champ. When is the last time you saw an adult doing this that wasn’t drunk or running from the police? I’m not suggesting we should just start dancing when we hear our jam come on in the market, although I’m not against it either. What I am suggesting is do what makes you feel good. Stop caring what people will say. Lift yourself up with confidence. That same confidence your child has about themselves. If you get an impulse to sing in your car, do it! If your body is telling you to move even if your embarrassed how you look, exercise! If you have an interest or a dream you want to pursue, stop worrying about failing or negative feedback, just dive in and do it for yourself. It is like this blog. I enjoy writing. I have been told I’m decent at it. I know that not everyone can be kind and I may get negative comments. I didn’t let that stop me cause when I write it makes me feel good. I was sick of just writing in a journal and not sharing it with anyone. If I get a bad comment I will choose to focus on the positive ones. Watching my kids on the playground has shown me so much about how they see the world. They get on a swing and all of a sudden it’s a rocket ship. They climb the jungle gym and they are on top of the highest mountain. They slide down the pole and they are an instant firefighter. The imagination is amazing. What this can teach us is to not let your imagination go by the wayside. Visualization is an amazing tool in manifesting what we want into our lives. Above that when my kids are on the playground they want to play with anyone who is down to play with them. They don’t care what they are wearing, the color of their skin, if they are a boy a girl or a squirrel. They just want to have fun and include other souls to have fun with. Kids don’t know what judgments are. Kids see the good in everything and everyone. Society changes that somehow. Of course we have to teach our kids to be cautious in this day an age. But how can we do this while still encouraging them to see through pure eyes? I sat down with my son Nolan and I asked him “What makes you awesome? What are you good at?” He proceeded with rattling off “I’m really good at sports and math and drawing and video games and handwriting.” I literally had to stop him. If I asked you what you are good at I think most of us would struggle with coming up with even 1 thing. I think we start to lose this confidence somewhere during our early adolescence when we received a negative comment, or we got laughed at, or didn’t do as well at something that we expected. I guess the point is we are all good at something. If we could embrace what it is and grow it we could be exceptional. I think we hold back because of fear. F. False E. Evidence A. Appearing R. Real. Fear of rejection, failure, or what others might think or say. Fear is our ego holding us back from growth. 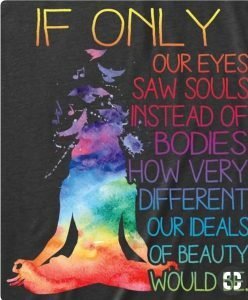 If we could only hold on to that unjaded view of our selves, how much better off would we be? Unfortunately my son is starting to get to the age that this is starting to fade. I think kids are so over stimulated with toys and electronics and us parents always trying to bring them fun places that the little things start to not be so cool anymore. I still see it with my 4 year old Lyla though. You could tell her to go pick every dandelion in the yard and she would think it’s the greatest thing on earth. She is so grateful and excited when she gets a new book or cloths or a yummy treat. She wants to help me cook, clean, fold laundry and all the house hold chores I dread. She does it willingly with an excitement that boggles my mind. I suppose what this has taught me is gratitude. I look at her having so much fun doing chores and I think you know what? I’m thankful to have a house to clean. I’m grateful to cook the food that keeps my family fed. I’m grateful to have working arms and legs to support myself in these mundane everyday so called nuisances. The ability to feel gratitude I believe is one of the most important feeling to have. We have all been on the receiving end of a child’s truth telling. This make me laugh because they really do tell it like it is. I know this can sometimes feel like a curse instead of a blessing. The filters that “most” of us develop as we age are definitely a good thing. But imagine what it must be like to really live your truth. To really know to your core who you are. Not to have to sugarcoat or make excuses for who or what you are. As adults we are a lot of times so scared of hurting someone’s feeling or saying the wrong thing at the wrong time that we may be doing someone that is really asking for help and honesty a disservice. Same with ourselves. We lie to ourselves all the time. We don’t have time for exercise or self care. We don’t deserve that promotion. We are ugly. We are stupid. We aren’t good enough. What you think about is what you become. You are giving those negative thought and beliefs about yourself momentum so more thought and things come into your experience to prove you right. Let’s start telling ourselves the truth. We are all good. We are all worthy and we are all pure positive energy at our core. I have been practicing everyday writing down or saying out loud positive affirmations about myself. It was really difficult at first and I felt really silly looking in the mirror telling myself how awesome I was, but then I noticed I started believing some of them. Think about if you walked in to a room and saw your child looking in the mirror saying “I am smart.” “I am beautiful.” I am compassionate.” “I am talented.” and so on. I would be like hell ya!!! That is so amazing! We lead by example. If your always lying to yourself and putting yourself down, is that the example you want for your kids? Why? Why? Why? Yup, when you are a parent you become very familiar with this word. They really want to know everything about everything. They are so curious and eager to learn. There is so much out there in this universe that we know nothing about. I was given the advice recently to get curious. I have never been more eager to learn. Even when you have come to be a master at your craft there is always something more to learn or expand. You are ignorant to believe you know everything there is to know about even 1 topic. Knowledge is power. I have also recently read something that stuck with me from Dr. Wayne Dyer. “Be open to everything and attached to nothing.” I love this so much because It reminds me to really listen and hear different perspectives. I have the ability and the right to listen, digest, and change my mind if it makes sense or not if it doesn’t. When I observe my kids and their emotions it amazes me. They could be all bent out of shape and angry one second and the next they are smiling and playing. They could be crying and sad and five minutes later they are asking for their favorite song. They can usually, especially the littler ones, snap out of their bad moods in no time. They are really good at staying in the moment. This is because they are listening to what their emotions are telling them. This doesn’t feel good so it must not be good. I better fix that. I realize for us adults it’s not that simple. What I’m suggesting is wherever you are on the scale there is always a better feeling thought that you can move up to. We can learn from our children to just be easy about it. We all have the in site and advise we need right inside of us. If it doesn’t feel good you are going in the wrong direction. The excitement I feel about what else my kids have to teach me in their lives is overwhelming. I’m starting to look at them and every person I come into contact with as teachers. There is not one creature on this planet that can’t teach you something. If my children accomplish nothing else in their lives but to really stay connected to who they are, a beautiful soul, I will have done my job because everything else will fall into place for them. Keep being a beautiful soul.